I feel rather bloated with fantasy right now. I think part of it was reading Lev Grossman’s The Magicians, which I loved, and David Mitchell’s The Bone Clocks, which I loved until 5/7 of the way through, very quickly in succession. In addition, my 5 year old and I are often reading fantasy together–we had just finished up Half Magic (Edward Eager). So when I began to read the Ramona books to Stella, she kept asking about when the magical things were going to take place, and when I told her there wasn’t magic in these books, she was disappointed, probably like when you first realize there isn’t actual magic in this world. Honestly the Ramona books were a bit of a shock to me too at first. The pacing is slow. In fact, not a lot happens in them except Ramona goes to school and gets into mischief in various ways. There are no mysteries to solve, and Ramona stumbles upon no magic coins. It’s a lot like real life. The parents are sometimes grumpy. I love the scene in Ramona Quimby Age 8 where, after a very miserable day, Ramona’s dad demands the whole family go out to dinner and have a great time even if it kills them. (Side note: the age of the dad is revealed in an earlier book to be 33, which made me kind of….sad. As I am a few years past that point. I am older than Ramona’s dad! Geez.) 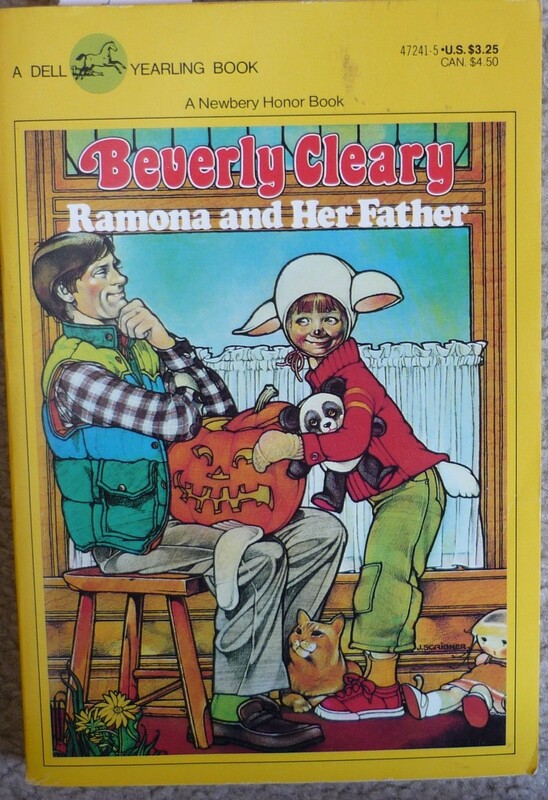 (I also can’t believe the Ramona books were written over 40 years ago). But despite the absence really of a plot, these books have a strong pull to them, and by the end our first Ramona book, both Stella and I were enchanted. Part of the pleasure of these books is that they take place pre-computer, in the relative quiet before the internet, smart phones, texting, ipads, and so forth. Kids spend their time banging bricks into powder outside, or Ramona’s older sister Beezus lays in bed reading books. The parents are not obsessed about local organic food. There are no CSA’s giving you lots of root vegetables which your children claim they will never eat, no matter how creatively you cook them. No one seems to be in after school activities or therapy. Even the school day is nostalgic for me in some ways. Desks. Worksheets. Arts and crafts made from paper bags. No mention of tests. I really want to go back to that time. I love the dad in Ramona and Her Father. He’s cranky. He lost his job. No one is hiring him. He smokes. He’s trying to quit. So often parents in children’s books seem either to be their child’s best friend and doing a really good job of parenting, or else they’re horrible parents making really enormous mistakes. It’s a relief to see Ramona’s parents fumbling around and trying to do their best. Ramona’s mom has to get a full time job, and she arrives home exhausted every night, and now Ramona has to eat store-bought cookies. Her mom is also too tired to make Ramona the sheep costume she wants for the nativity scene at church. It’s painful to watch parents with good intentions still disappointing their children but, at the same time, it’s a relief to see this portrayed with such generosity. Have the Ramona books made anyone else cry? Something in them is this gentle acknowledgment, to both child and parent readers, that being part of a family is really hard. That there are no perfect families. That there will be moments of joy amid all the trouble. That you don’t have to be happy to love each other. Here’s one of my favorite passages. Ramona and her dad decide to draw the longest picture in the world together. I love the dad’s inability to promise something his daughter wants and how he isn’t able to look at his daughter when he says he’ll try. What a great detail. The line about the geese at the end, ending the chapter, is lovely. “Together they went to work, Ramona on the end of the shelf paper and her father half-way across the kitchen. With crayons Ramona drew a long black bridge with a girl standing astride a line in the center. She drew blue water under the bridge, even though the Columbia River always looked gray. She added gray clouds, gray dots for raindrops, and all the while she was drawing she was trying to find courage to tell her father something. Ramona glanced at her father’s picture, and sure enough he had drawn Mount Hood peaked with a hump on the south side exactly the way it looked in real life on the days when the clouds lifted. “I think you draw better than anybody in the whole world,” said Ramona. Mr. Quimby smiled.“Not quite,” he said. “You weren’t mean.” Mr. Quimby was adding trees at the base of the mountain. “Am I?” Ramona wanted to be sure. “He can try, too,” said Ramona and slashed dark V’s across her gray sky to represent a flock of geese flying south for the winter.